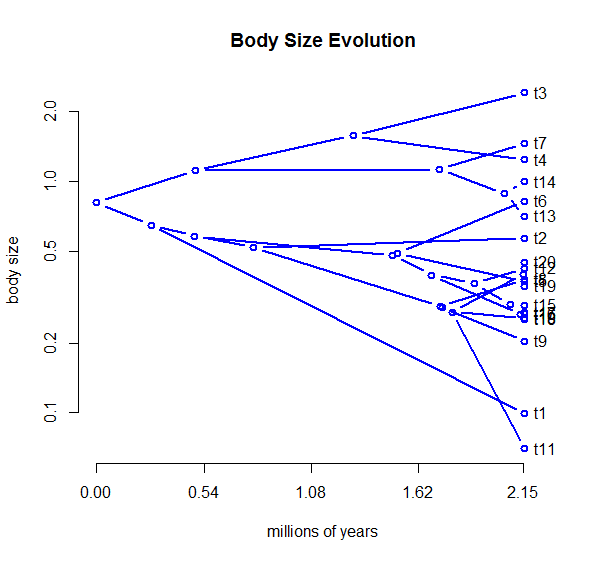 The phytools function phenogram does a projection of the phylogeny into a space defined by time since the root (on the x axis) and phenotype (on y). It has some nice features, for instance it can map the state of a discrete character on the tree, but it also had a couple of small bugs associated with labeling the leaves - specifically, the alignment of tip labels is messed up, and it sometimes did not leave enough whitespace right of the tips for labels to be printed. I decided to do a significant overhaul of phenogram to both try and fix these issues as well as to enable a lot more user control of plotting within the function. The source code for the new version of phenogram is here. It will also be updated in the next version of phytools. Cool stuff Liam. Have you considered adding an option to plot 95% confidence intervals for the ancestral trait reconstructions? For what it's worth, I did this once using "segments" and it looked a bit messy (lots of lines, and hard to interpret when there are many nodes in a short time interval), but it was nonetheless pretty useful. Thanks, Luke. Did you see this: http://blog.phytools.org/2013/02/visualizing-uncertainty-in-traitgram.html?